Gliński's hexagonal chess by Władysław Gliński (1936) was popular in Eastern Europe with a reported half-million players. It is one of more than 2,000 published chess variants. different chessboard (larger or smaller, non-square board shape overall or different intra-board cell shapes such as hexagons). Regional chess games, some of which are older than Western chess, such as chaturanga, shatranj, xiangqi and shogi, are typically called chess variants in the Western world. They have some similarities to chess and share a common game ancestor. The number of possible chess variants is virtually unlimited. Confining the number to published variants, D. B. Pritchard, author of The Encyclopedia of Chess Variants, estimates there are well over 2,000. In the context of chess problems, chess variants are called fantasy chess, heterodox chess or fairy chess. Some chess variants are used only in problem composition and not in actual play. These chess variants are derived from chess by changing the board, setup, pieces or rules. In these variants, the starting position is different, but otherwise the board, pieces and rules are the same. In most such variants the pawns are placed on their usual squares, but the position of other pieces is either randomly determined or selected by the players. The motivation for these variants is to nullify established opening knowledge. The downside of these variants is that the initial position has usually less harmony and balance than the standard chess position. Chess960 (or Fischer Random Chess): The placement of the pieces on the first rank is randomised, with the opponent's pieces mirroring it. Invented by Bobby Fischer (1996). Displacement chess: Some pieces in the initial position are exchanged but the rules remain exactly the same. Some examples of this may be that the king and queen are flipped, or the knight on the b-file is traded with the bishop on the f-file. Pre-Chess: Proposed by Pal Benko in 1978. The game starts with white and black pawns set as usual, but the initial position of other pieces is selected by the players in the following way: first, White places one of his pieces on his first rank, and then Black does the same. Players continue to alternate in this manner until all pieces have been placed, with the only restriction being that bishops must be placed on opposite-colour squares. Then the game proceeds in the usual way. Castling is permitted only if the king and a rook were placed on their usual squares. Transcendental chess: Similar to Chess960, but the opening white and black positions do not mirror each other. Some chess variants use different numbers of pieces for White and Black. All pieces in these games are standard chess pieces, there are no fairy chess pieces. Dunsany's chess (and the similar Horde chess): One side has standard chess pieces, and the other side has 32 pawns. Endgame Chess (or The Pawns Game): Players start the game with only pawns and a king. Normal en passant, check, checkmate and pawn promotion rules apply. Handicap chess (or Chess with odds): Variations to equalise chances of players with different strength. Legal's Game (or The Pawns game): White has no queen but eight additional pawns. The game was played by such old masters as Labourdonnais, Deschappelles and Kieseritsky. Peasants' Revolt: White has a king and eight pawns (the peasants) against Black's king, pawn and four knights (the nobles). Black has the advantage. To narrow the contest, the game has also been played with three knights (on b8, c8 and g8) instead of four. By R. L. Frey (1947). Weak! : White has usual pieces, Black has one king, seven knights and sixteen pawns. This game was played at Columbia University chess club in the 1960s. Absorption Chess: A capturing piece gains the movement abilities of the piece it captures. Therefore, if a rook captured a bishop, the rook would then be able to move like a queen as it can move like the rook and now the bishop. This rule does not apply to kings and pawns. Absorption Chess II (or Seizer's Chess): Similar to Absorption Chess. A capturing piece gains the movement of the piece captured. The rule does apply to kings and pawns. Andernach chess: A piece making a capture changes colour. Atomic chess: Capture on any square results in an "atomic explosion" which kills (i.e. removes from the game) all pieces in the eight surrounding squares, except for pawns. Beirut Chess: Players secretly equip one of their men with a "bomb", which can be detonated at any time, wiping out all pieces on surrounding squares. Win by checkmating the opponent, or blowing up his king. By Jim Winslow (1992). Benedict chess: Pieces are not allowed to be "captured". Example: if a white bishop 'captures' a black knight, that knight is then removed and replaced with a white knight on the same square. The 'attacking' bishop does not move. 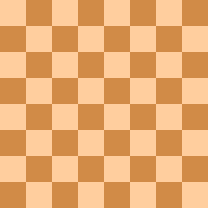 Checked chess: Each player, either before or after their move, may place one captured piece on any unoccupied square on the board. Checkers chess: Normal rules of chess. However, pieces can only move forwards until they have reached the far rank. Checkless chess: Players are forbidden from giving check except to checkmate. Circe chess: Captured pieces are reborn on their starting squares. Contramatic Chess: Players may not give check, but may put their own king in check by the enemy. A player wins when his opponent cannot escape giving check. By V. R. Parton. Co-Regal Chess: Queens can be checkmated as well as kings. By V. R. Parton. Crazyhouse: Captured pieces change the colour and can be dropped on any unoccupied location. There are two variations of this variant, known as Loop chess and Chessgi. Cubic Chess: Piece cubes display the six piece types, a player can promote any pawn by rotating its cube to match a captured piece type. By Vladimír Pribylinec (1977). Dodo Chess: A race similar to Racing Kings, with players competing to be first to get their king from first rank to eighth rank. Captures, but no checks or checkmate. By V. R. Parton. Dunce's Chess: Moves, captures, and checks are in a forward direction only. Pawns do not promote. Win by checkmate or stalemate. By V. R. Parton. Dynamo Chess: Capturing is replaced by pushing or pulling enemy pieces off the board. By Hans Klüver and Peter Kahl (1968). A close variant of Push Chess (by Fred Galvin, 1967). Einstein chess: Pieces transform into more or less powerful pieces when they move. Extinction chess: To win, a player must capture all of any one type of pieces of the opponent (for example, all the knights an opponent has, or all their pawns, etc.). Genesis Chess: The game begins with an empty board and opponents take turns placing down or moving pieces. Gryphon Chess: Players start without kings, a moved piece transforms to the next type in the series P→N→B→R→Q→K. Mating any enemy king wins. By V. R. Parton. Guard chess (or Icelandic chess): Allows captures only when a piece is completely unprotected by friendly pieces. Checkmate occurs when the piece forcing the mate is protected and therefore cannot be captured. Hierarchical chess: Pieces must be moved in the order: pawn, knight, bishop, rook, queen, king. A player who has the corresponding piece but cannot move it loses. Hostage Chess: Captured pieces are held in the capturer's "prison", and can be released by the opponent and dropped into play (ala shogi) via a "hostage exchange". By John Leslie (1997). Identific: Players set 12 counters on the board, which become defined as chess pieces as play continues. By V. R. Parton. Idle Kings' Chess: Players play without kings until move 13, when kings are placed on any square not in check. Kings immobile unless checked. By V. R. Parton. Jedi Knight chess: Knights may move three steps diagonally or horizontally or both, depending on the rules accepted. Kamikaze chess (or Hara-Kiri chess): When capturing, the capturing piece is removed from play also. So, a king cannot defend itself by capturing an attacker. A capture is not allowed if it exposes the king to discovered check. Idea from B. G. Laws (1928). Kamikaze chess: A variant of Losing chess. The king is royal and removing a check takes precedence over capturing. The king must be lost last; moving into check is permitted after all other men have been captured. Kinglet Chess (or Imperial Fiddlesticks): The winner is the first to eliminate all eight of the opponent's pawns. No check or checkmate; kings are capturable like other pieces. By V. R. Parton. Knight Relay chess: Pieces defended by a friendly knight can move as a knight. Knightmate (or Mate The Knight): The goal is to checkmate the opponent's knight (initially on e-file). The kings on b- and g-files can be captured as other pieces. Pawns can promote to kings but not to knights. By Bruce Zimov (1972). Legan chess: Played as if the board would be rotated 45°, initial position and pawn movements are adjusted accordingly. Losing chess (or Antichess, Giveaway chess, Suicide chess, Killer chess, Take-all chess, Reverse chess): Capturing moves are mandatory and the object is to lose all one's pieces. There is no check - the king is captured like an ordinary piece. Madrasi chess (or Weird chess): A piece which is attacked by the same type of piece of the opposite colour is paralysed. March Hare Chess: Players move two pieces per turn: first their own man, then one of their opponent's men. By V. R. Parton. Mock Chess: Kings have no royal power; captures are compulsory. Win by capturing the entire enemy army. By V. R. Parton. Monochromatic chess: All pieces must stay on the same colour square as they initially begin. Patrol chess: Captures and checks are only possible if the capturing or checking piece is guarded by a friendly piece. PlunderChess: The capturing piece is allowed to temporarily take the moving abilities of the piece taken. Pocket Knight Chess (or Tombola Chess): Players have an extra knight they keep at the side of the board. Once during the game, a player may place the knight on any empty square for his move. Play then proceeds as normal. Racing Kings: first king to 8th rank wins. Portal Chess: Any of a number of games that involve pieces or squares for teleportation around the board(s). Progressive Chess: The initial piece placement is the same as in regular chess, but in this players, rather than just making one move per turn, play progressively longer series of moves. Racing Kings: Players race kings to the 8th rank. Captures, but no checks or checkmate. "... one of the more inspired creations of Vernon Parton". Refusal chess (or Outlaw chess, Rejection chess): A played move can be refused by the opponent, forcing the first player to change to another move, which must be accepted. The only exception is when only one legal move is possible. Reincarnation Chess: A captured piece can turn into a zombie, then reincarnate back into the game as a normal piece if captured again. By Philip M. Cohen (1960s). Replacement chess: Captured pieces are not removed from the board but relocated by the capturer to any vacant square. Rifle chess (or Shooting chess, Sniper chess): When capturing, the capturing piece remains unmoved on its original square, instead of occupying the square of the piece captured. Royal Chess: In addition to its standard movement capabilities, the queen may be placed on any square the player's king could have been moved to during the player's turn. If the player's king could have captured a piece, the queen may also capture that piece. Synchronistic Chess: Players record then reveal their moves to be played simultaneously on the board. Resolution rules are provided for anomalous conditions. By V. R. Parton. Take-All: The first player to capture all opposing pieces wins. The king is allowed to move into check and pawns can be promoted to kings. Three-check chess: A player wins if he checks the opponent three times. Unirexal Chess (or The Black King's Complaint): Black's king is replaced by a queen. If Black does not mate White within an agreed number of moves, White wins. A variation gives Black 20 knights and the mandate to mate within 50 moves. By V. R. Parton. Way of the Knight: Somewhat based on role-playing games, where pieces can improve their experience levels and so promote by capturing. In these variants one or both players can move more than once per turn. The board and the pieces in these variants are the same as in standard chess. Avalanche chess: Each move consists of a standard chess move followed by a move of one of the opponent's pawns. Doublemove Chess: Similar to Marseillais chess, but with no en passant, check or checkmate. The object is to capture the king. By Fred Galvin (1957). Double-Take Chess: Each player, once per game, can make two moves during one of their turns. These two moves cannot be used to place the opponent's king in checkmate. Kung-Fu chess: A variant without turns. Any player can move any of his pieces at any given moment. Marseillais chess (or Two-move chess): After the first turn of the game by White being a single move, each player moves twice per turn. Monster chess (or Super King): White has the king and four pawns against the entire black army but may make two successive moves per turn. Progressive chess (or Scottish chess): White moves once, then Black moves twice, then White moves three times, and so on. In these variants, luck or randomness sometimes plays a role. Still, like in poker or backgammon, good luck and bad luck even out over the long-term with clever strategy and consideration of probabilities being decisively important. ChessHeads: Played with cards that change the game rules. Dark chess: The player sees only squares of the board that are attacked by their pieces. Dice chess: The pieces a player is able to move are determined by rolling a pair of dice. Fantasy Chess: Chess with wargaming added. Players fight for squares (which can be co-occupied) using dice. Can be expanded to four players; piece capability can improve each game. Invisible Chess: Neither player can see a piece on the board, until it is moved. Knightmare Chess: Played with cards that change the game rules. Kriegspiel: Neither player knows where the opponent's pieces are but can deduce them with information from a referee. No Stress Chess: Marketed for teaching beginners, the piece(s) a player is able to move are determined by drawing from a deck of cards, with each card providing the rules for how the piece may move. Neither castling nor en passant is allowed. Penultima: An inductive variant where the players must deduce hidden rules invented by "Spectators". Play It By Trust: By Yoko Ono (1966). Both players' pieces are white, which means after a few moves, players must learn to trust each other as to whose pieces are whose. Schrödinger's chess: Players' minor pieces are concealed so the opponent does not know what they are until revealed. When covered, pieces move in a restricted way (as queens that can only move two squares). Synchronous chess: Players try to outguess each other, moving simultaneously after privately recording intended moves and anticipated results. Incompatible moves, for instance to the same square with no anticipated capture, are replayed. Alternatively, two pieces moving to the same square are both captured, unless one is the king, in which case it captures the other. Play ends with capture of king. Viennese Chess: A barrier or screen between the two halves of the chessboard, two players then place their pieces on their half of the board. The barrier is then lifted and the game is then played as in orthodox chess. In these variants the same pieces and rules as in chess are used, but the board is different: It can be smaller or larger, non-square overall, or based on hexagonal or triangular cells (instead of square cells) or even modular regarding shape or number of cells; it can even be extra-dimensional. The movement of pieces in some variants is modified in concurrence with the geometry of the gameboard. Active Chess: Played on a 9x8 board, an extra queen with an extra pawn in front. Invented by G. Kuzmichov (1989), his students tested the game, deciding optimum startup was to place the second queen on the eighth or ninth files. Balbo's Game: A novel-shaped board with 70 squares. Full armies for each player, minus one pawn. No castling. By G. Balbo (1974). Brusky's hexagonal chess: Chess on an irregular board of 84 hex cells. Same as Gliński's hex chess, but with ten pawns instead of nine, linear startup, two forward move directions for pawns, pawns capture forward diagonally, and castling. By Yakov Brusky (1966). Cheshire Cat Chess: After each move, the square vacated "disappears" from the chessboard. Pieces may not occupy disappeared squares, but may pass through them. By V. R. Parton. Chess Attack: Played on a six-row five-column board, Chess Attack follows standard chess rules, and can be regarded as an endgame variant. Circular chess: Played on a circular board consisting of four rings, each of sixteen squares. Cross Chess: Cross-shaped cells, board geometry like hex chess but moves akin to normal chess (e.g. bishops have four directions not six; queens eight, not twelve). Extra rook, knight, and pawn per side. By George Dekle Sr.
Cubic Chess: A 3D variant similar to Raumschach but played on a 6x6x6 board. 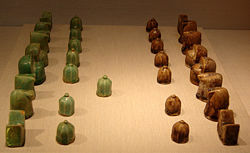 Each player has six pieces and twelve pawns. By V. R. Parton. Cylinder chess: Played on a cylinder board with a- and h-files "connected". Thus a player can use them as if the a-file were next to the h-file (and vice versa). De Vasa's hexagonal chess: Chess on a rhombus-shaped board of 81 hex cells. Same as Gliński's hex chess, but linear startup, two forward move directions for pawns, pawns capture forward diagonally to the side, and castling. Invented by Helge E. de Vasa (1953). Double Chess: Two full armies per side on a 12x16 board, the first to mate an enemy king wins. Pawns advance up to four steps on their first move. Capablanca found the game "remarkably interesting" and played a match with Maróczy. Doublewide chess: Two or four regular chessboards are connected (for a 16x8 or 16x16 play surface) and each player plays with two complete sets of chess pieces. Because each player has two kings, the first king can be captured without ending the game. Flying chess: Played on a board of 8x8x2, giving a total of 128 cells. Only certain pieces can move to and from the additional level. 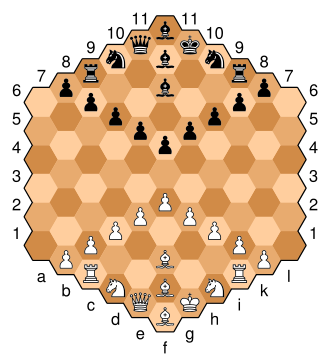 Gliński's hexagonal chess: The most popular version of chess for the hex board. Includes three bishops, nine pawns, 91 hex cells. Invented by Władysław Gliński (1936). Grid chess: The board is overlaid with a grid of lines. For a move to be legal, it must cross at least one of these lines. Hexagonal chess: A family of variants played on a hexgrid with three colours and three bishops. Masonic Chess by George Dekle Sr.
Infinite chess: Has a board shaped like the infinity symbol. It is connected at the centre, and all pieces of the traditional chess are used. Lord Loss chess: Played on five different boards with two players. One person moves a piece on any board and his/her opponent can choose to move on a different or the same board. The game is featured in the book Lord Loss by Darren Shan. Los Alamos chess (or Anti-Clerical chess): Played on a 6x6 board without bishops. This was the first chess-like game played by a computer program. Masonic Chess: Every other board rank is indented. Same as chess, with moves adapted to the new brickwork-like board. By George Dekle Sr.
McCooey's hexagonal chess: Chess on the same hexagonal board as Gliński's hex chess, but using a different starting array, seven pawns instead of nine, and pawns capture forward diagonally. By David McCooey and Richard Honeycutt (1978-79). Millennium chess: Similar to Doublewide chess. Two boards are connected side by side; however, in this variant the middle files are merged, making a 15x8 board. Millennium 3D Chess: An easy-to-learn 3D variant played on an 8x8x3 board. By William D'Agostino (2001). Minichess: A family of variants played with regular chess pieces and standard rules, but on a smaller board. Polgar reform chess: László Polgár proposed in his book Reform-Chess (1997) several variants played on board of size 8x6, 5x8, 9x6 or 6x8. 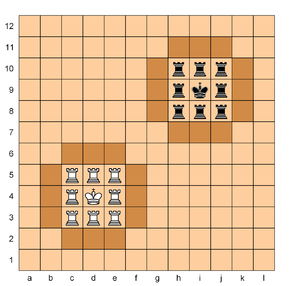 The initial piece setup is determined by players in the same way as in Benko's Pre-chess. There are special rules for castling depending on the board. Polgar recommended these variants to train creativity and to speed up the game. Polgar Superstar Chess: Hexagonal variant played on a special star-shaped board. Invented by László Polgár (2002). Rhombic Chess: Uses a hex-shaped board comprising 72 rhombus cells. Normal set of chess pieces move edgewise or pointwise. Checkmate objective as usual. By Tony Paletta (1980). Shafran's hexagonal chess: Chess on an irregular hex board of 70 cells. Same as Gliński's hex chess, but differs by: starting setup, pawn first-move options, pawns capture forward diagonally, castling. Invented by Grigorevich Shafran (1939). Singularity chess: Played on a board distorted in the centre. Due to the distortion, some pieces can make U-turns, attack the same square multiple ways, and bishops can possibly change square colours (e.g., starting on a black square and ending on a white square). 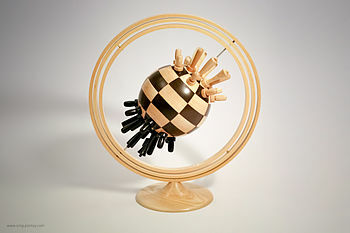 Spherical chess: A family of variants played on a chessboard wrapped around a sphere. The a- and h-files are adjacent. The poles are circular or octagonal and may or may not be occupied according to the variant. There are no board edges so kings always have eight adjacent squares. Trans-polar diagonal moves mostly differentiate between variants. Three-dimensional chess (or 3D chess): A family of variants using two or more boards at different levels. Tile Chess: No fixed board exists; the pieces are affixed to (or consist of) square tiles, which are introduced in the opening moves of the game. The "board" consists of the space formed by the tiles and space between them, and it is illegal to make a move that causes the tiles to lose cohesion once all have been introduced. By Jason Wittman, published (but out-of-print) by Steve Jackson Games. Tri-D Chess (or Star Trek chess): The 3D version of chess depicted in the television series Star Trek. Rulesets created by fans. Tweedle Chess (or Twin Orthodox Chess): Played on a 10x10 board, each side has an additional king and queen. Win by mating either enemy king. By V. R. Parton. Various mathematical studies have been performed on chess played on an infinite edgeless board. Alice Chess: Played with two boards: a piece moved on one board passes "through the looking glass" onto the other board. By V. R. Parton (1953). Apocalypse: On a 5x5 board, each side has two knights and five pawns, win by eliminating all enemy pawns. Prepared moves are executed simultaneously. By C. S. Elliott (1976). Chad: Kings are limited to 3x3 "castles" on a 12x12 board dominated by eight rooks per side which can promote to queens. By Christian Freeling (1979). 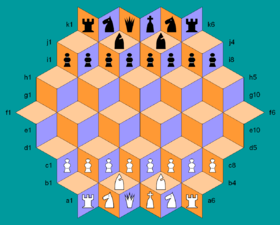 Chessence: Nine men per player move according to their relative positions to each other on a 6x9 board with missing squares and kings immobile in the corners. By Jim Winslow (1989). Congo: Kings (lions) are limited to 3x3 "castles" on a 7x7 board. By Demian Freeling (1982). Damate: A cross between chess and draughts on a 10x10 board. Men move normally (except pawn rules are modified) but capture by jumping à la checkers. (R, B, Q can long-jump; K and P short-jump any adjacent piece.) Win as in checkers by eliminating all the opponent's men. By V. R. Parton. Diplomat chess: Played on a circular board with 43 cells, including the centre circle which is considered orthogonal and diagonal to every adjacent cell. Includes a 'diplomat' piece which instead of capturing can suborn enemy pieces. Dragonfly: Played on a 7x7 or hex board, no queens, captured non-pawn pieces never die (ala Chessgi) and can be dropped on any open square. By Christian Freeling. Jesön Mor: Nine knights per side on a 9x9 board. The first to occupy square e5 then leave it, wins the game. From Mongolia. Looking-Glass Chess: Two separate games on two boards. A move on one board must be reflected 'through the looking-glass' on the second board. So a king is compelled to move multiple squares to reflect a queen's move. By V. R. Parton. Parallel Worlds Chess: A 3D variant using three boards, each player commands two armies, capturing either enemy king wins. The middle board is a sort of "twilight zone" obeying its own rules. By R. Wayne Schmittberger (1980s). Regimental Chess: Played on between one to six boards lined up measuring 12x16, each side has an "army" for each board. Multiple adjacent or mutually-supporting pieces can form "formations" and move together to capture multiple pieces in a single move. Capturing an army's king removes that entire army from the game. In every round, each player gets a move for each king they have on the board, moving a formation with a piece of that king's colour. Rollerball: Inspired by the sci-fi film of the same name, pieces move clockwise around a Roller Derby-like track. By Jean-Louis Cazaux (1998). Troy: The Trojan war fought on a 91-cell hexagonal board. Achilles/Hector are immune from capture by Trojan/Greek soldiers. By the Fanaat games club (the Netherlands). Zonal chess: Board has triangular wings or "zones" on either side of the main 8x8 board. Queens, bishops and rooks that start from one of the squares in either zone may change direction and keep going on the same move. 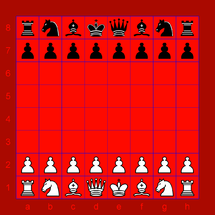 A queen, for example, could zig around an obstruction and attack a piece in the opposite zone. The power to change direction only applies when a piece's move starts from a zonal area. It is possible (using the queen and rook) to cross the board from one zone to another, but any piece entering a zone cannot make use of the extended move. Most of the pieces in these variants are borrowed from chess. The game goal and rules are also very similar to those in chess; however, these variants include one or more fairy pieces which move differently from chess pieces. Anti-king chess. The anti-king is shown as an inverted king. Anti-King chess: Features an anti-king. This piece is in check when not attacked. If a player's anti-king is in check and unable to move to a square attacked by the opponent, the player loses (checkmate). The anti-king cannot capture enemy men, but can capture friendly men. A king may not attack the opponent's anti-king. The anti-king may not check its own king. Other rules the same as in standard chess, including check and checkmate to the regular king. By Peter Aronson (2002). Baroque (or Ultima): Pieces on the first row move like queens, and pieces on the second row move like rooks. They are named after their unusual capturing methods. For example, Leaper, Immobilizer and Coordinator. Berolina chess: Which uses the Berolina pawn instead of the normal pawn, all other things being equal. 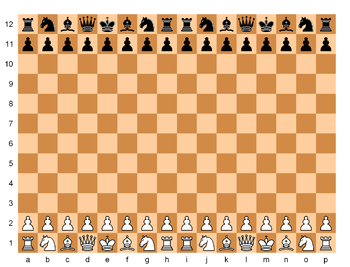 Chess with different armies: Two sides use different sets of fairy pieces. There are several armies of approximately equal strength to choose from including the standard FIDE chess army. Duell: Dice are used instead of pieces. Falcon-Hunter Chess: Falcon moves forward as a bishop; backward as a rook. The hunter moves forward as a rook; backward as a bishop. Players introduce the fairies as the game progresses. By Karl Schulz (1943). Grasshopper chess: The pawns can promote to grasshopper, or grasshoppers are on the board in the initial position. Pocket mutation chess: Player can put a piece temporarily into the pocket, optionally mutating it into another (including fairy) piece. Pole chess: Players have an uncapturable piece called a "Pole". The Pole, which does not begin on the board, may be moved to any empty cell as a legal move. The Pole can thus be used to block check, making it harder to achieve mate. Mentioned in the novel Robot Adept by Piers Anthony. There are a number of variants which use empress (rook+knight) and princess (bishop+knight) compound pieces. Several other different names have been given to them. The empress (R+N) is also named marshall, chancellor, etc. The princess (B+N) is also called cardinal, archbishop, janus, paladin, Prime Minister, etc. To adapt the two new pieces, the orthogonal board is usually extended to 10x8 or 10x10 with two additional pawns added. Almost Chess: Uses an 8x8 board, with the conventional starting position, but queens are replaced by chancellors (R+N). By Ralph Betza (1977). A related variant is Sort of Almost Chess (Ralph Betza, 1994), where one player has a queen and the other has a chancellor. Capablanca chess: A variant by the former world chess champion, José Raúl Capablanca. Played on a 10x8 board with chancellor (R+N) and archbishop (B+N). Capablanca random chess: Generalises all possible variants of Capablanca chess with random starting positions following a method similar to that used in Chess960. By Reinhard Scharnagl (2004). Chigorin Chess: Similar to Sort of Almost Chess (above), but White's minor pieces are all knights and Black's are all bishops. By Ralph Betza (2002). Embassy Chess: Uses a 10x8 board with marshall (R+N) and cardinal (B+N). The starting position is borrowed from Grand chess. By Kevin Hill (2005). Gothic chess: A commercial variant. Played on a 10x8 board with chancellor (R+N) and archbishop (B+N). Grand chess: Uses a 10x10 board with marshall (R+N) and cardinal (B+N). Invented by Christian Freeling (1984). Janus chess: Uses a 10x8 board with two januses (B+N). By Werner Schöndorf (1978). Maharajah and the Sepoys: Black has a complete army, White only one piece - Maharajah (queen+knight). Modern chess: Played on a 9x9 board, with an extra pawn and a Prime Minister (B+N). By Gabriel Vicente Maura (1968). Seirawan chess: Uses a standard 8x8 board with elephant (R+N) and hawk (B+N). By GM Yasser Seirawan (2007). The pieces in these variants are borrowed from both chess and another game. The game goal and rules are either the same or very similar to those in chess. However, these variants include one or more fairy pieces which move differently from chess pieces. Chessers: By Christopher Schwartz and Sander Beckers. Played on a regular chessboard but with checkers pieces integrated into otherwise standard chess. Checkess: Standard chess but played with the standard rules of checkers instead. Pawns being regular pieces and rooks being kings. It is set up like a checkers board instead of a chess board. It is played on a regular chessboard. Playing cards on a chessboard: A card game allowing open play on a board with rectangular sectors where the chances to win are equal for both players, just as in chess or checkers but with application of traditional rules of playing cards. Proteus: By Steve Jackson Games. Played on a regular chessboard using 8+8 dice with a different chess piece on each side. Each turn a player must rotate one die and move another like the corresponding piece moves. Instead of a king, the dice have a new piece (Cubic chess with cubes as pieces was first published in 1977). The Pyramid cannot move, capture or be captured. Winner is determined with a scoring system based on the value of captured pieces. Queens can be captured on both the square they occupy and the square directly behind them. Bomberman chess: Inspired by the Bomberman video game series. Played on an 10x8 board with special Bomb and Defuser pieces. The Bomb piece can be exploded on its turn in vertical and horizontal directions (similar to the movement of a rook), destroying any pieces in the blast range, and the Defuser piece can capture a bomb piece. Chesquerque: Played on four Alquerque boards combined. Extra pawn and an archbishop per side. By George Dekle Sr.
Das chess: The board is 10x10 squares, and each side has eleven pawns and eleven pieces: 1) six standard pieces: king, queen, two bishops, rook, knight and 2) five new pieces: amazon, ship, valkyrie, magister, centurion. By Nikolay Batirev (2013). Decimal Falcon-Hunter Chess: Falcon-Hunter played on a 10x10 board with falcons and hunters already deployed. 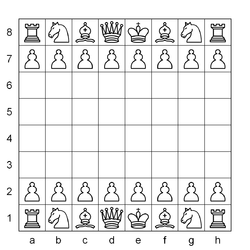 Decimal Rettah Chess: Each side has two kings (rettahs) and two queens on a 10x10 board. Rettahs are amazons (Q+N), and when attacked the attacker must be captured at once. Capture both rettahs to win. By V. R. Parton. Dragonchess: Uses three stacked 8x12 boards, with fantasy pieces. By Gary Gygax, co-creator of Dungeons & Dragons. Gess: Chess with variable pieces, played on a Go board. Omega chess: On a 10x10 board with four extra squares, one per corner. Includes the Champion and the Wizard fairy pieces. Both are leapers, with different ways of leaping. Parachess: Sequel to Rhombic Chess on same 72-rhombus board. Introduces "arcwise" and "wavepath" movements; sorcerers instead of knights. By Tony Paletta (c. 2000). Persian Chess: Played on a 9x9 board with 4 citadel squares. Includes the Princess and the Fortress compound pieces. Raumschach: Called "the classic 3D game" (Pritchard). Played on a 5x5x5 board, including a new piece (the unicorn) for moving through cube vertices. Shako: Played on a 10x10 board. New pieces are the Cannon from xiangqi (Chinese chess) and an Elephant moving as Fers+Alfil of old shatranj (ancestors of queen and bishop), so diagonally one or two squares with jumps allowed. Stealth chess: Played in the fictional Ankh-Morpork Assassins' Guild from the Discworld series of books; played on an 8x10 board. The fairy piece is the Assassin. Stratomic: Adds nuclear missiles to the standard chess array on a 10x10 board. When launched they irradiate any 3x3 area (friendly pieces included) except kings. By Robert Montay-Marsais (1972). Triangular Chess: Board comprises 96 triangles. Rook and bishop have three directions; the queen, six. Three extra pawns and a unicorn. By George Dekle Sr.
Tri-Chess: A variation of Triangular Chess. Rook and bishop are increased to six directions; the queen, to twelve. By George Dekle Sr.
2000 A.D.: Played on a 10x10 board, features pieces Empress, Capricorn, Gorgon, Chimaera, Dragon, Mimotaur, Unicorn, and Fury. By V. R. Parton. Wildebeest Chess: Uses an 11x10 board, each player has two camels and a wildebeest (camel+knight). Pawns move one, two, or three squares initially. By R. Wayne Schmittberger (1987). Wolf Chess: On an 8x10 board, with fairy pieces wolf (R+N), fox (B+N), nightrider, sergeant (almost a Berolina pawn), and elephant (Q+nightrider). By Arno von Wilpert (1943). Queen's Quadrille. All pieces are placed randomly. Hippodrome. All pieces are placed randomly, except the knights. Similar to card solitaires, there are a few chess variants for a single player. In difference to chess puzzles, these variants have a random starting position. Some of these variants are similar to permutation chess problems, for example the game Queen's Quadrille, which was invented by Karen Robinson in 1998. All chess pieces (except pawns) are randomly placed on a 4x4 board. Then one of the queens is removed and the game is started. Pieces move as usual, however capturing is not allowed. A player can move white and black pieces in any order, without regard for colour. The goal is to move the queen to one of the corners, or visit all squares on the board only once. The same idea is found in the game Hippodrome, which was invented by Andy Lewicki in 2003. The initial position is obtained by placing four knights on the first row and all other pieces from a chess set (except pawns) on the remaining fields. Then one of the pieces (except knights) is removed and the game is started. The goal is to move all knights to the opposite rank. In 1998 Karen Robinson also invented a game which Hans Bodlaender named Chess Contradance, as the setup is like a contradance with the two lines facing each other. Set the pieces up as in regular chess, but without the pawns. The first and eighth ranks are safe havens, i.e., no piece can be captured on these ranks. The object of the puzzle is to move the pieces such that all pieces move to the opposite back row without ever putting any piece in danger of being captured. Black and white alternate moves. Karen now prefers the name Grand March for this game. Bosworth: A four-player variant played on 6x6 board. It uses a special card system with the pieces for spawning. 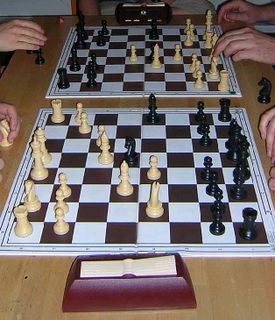 Bughouse chess (or Double chess, Exchange chess, Siamese chess, Swap chess, Tandem chess, Matrix chess, Transfer Chess, Advanced Teamwork Chess, Supply Chess): Two teams of two players face each other on two boards. Allies use opposite colours and give captured pieces to their partner. The two-player version of the game, played with only one board, is Crazyhouse. Business chess: Played with two teams using normal chess playing rules but allowing up to five variations of the game. The team may discuss and play alternative moves freely. Djambi: Can be played by four players on a 9x9 board and four sets of special pieces. Pieces can capture or move those of an adversary. Captured pieces are not removed from the board, but turned upside down. 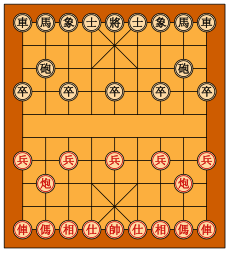 There are variants for three or five players (Pentachiavel). Enochian chess: A four-player variant with magical symbolism, associated with the Hermetic Order of the Golden Dawn. Forchess: A four-player variant using the standard board and two sets of standard pieces. Fortress chess: A four-player variant played in Russia in 18th and 19th centuries. Four-player chess (or Four-handed, Four-man, Four-way chess): Can be played by four people and uses a special board and four sets of differently coloured pieces. Mad Threeparty Chess: For three players on a 10x10 board. Each player has two enemy kings to attack, and two of his own to defend. By V. R. Parton. Quatrochess: A four-player variant, in addition to the standard chess army, each side controls a chancellor, archbishop, mann, wazir, fers, two camels, and two giraffes. By George Dekle Sr. Three-Man Chess: Three chessboard halves fused into one, first to checkmate wins. By George Dekle Sr.
Three-player chess: A family of variants specially designed for three players. Tri-Chess: For three players; 150 triangular cells; chancellor and cardinal replacing queen. By George Dekle Sr. These variants are very different from chess and may be classified as abstract strategy board games instead of chess variants (by restrictive, proper definition). Arimaa: A game inspired by Garry Kasparov's defeat by chess computer Deep Blue. This game is easy for people to understand but difficult for computers to play well. To prove that Arimaa is computer resistant, a $10,000 USD prize is offered for developing a program to defeat the top human Arimaa players. Chess4: Public-domain game designed to introduce chess to young children. ChessWar: Complex strategy game played with chess pieces and board. Martian chess: Played with Icehouse pieces. Navia Dratp: A cross between shogi and miniature wargaming. Shuuro: A cross between chess and miniature wargaming. The Duke: An abstract strategy game where the board, pieces, and gameplay mechanics have some strong parallels with chess. Flick Chess: No rules chess. Players need to flick pieces to knock down the entire opponent's army. A mobile version was published by Sama Sama Studios. Some of these games have developed independently while others are ancestors or relatives of modern chess. 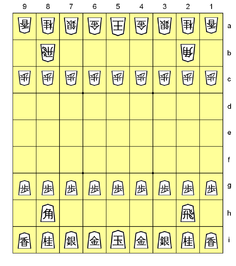 The popularity of these variants may be limited to their respective places of origin (as is largely the case for shogi), or worldwide (as is the case for xiangqi). The games have their own institutions and traditions. Chaturaji: Four-handed version of chaturanga, played with a die. Chaturanga: An ancient East Indian game, presumed to be the common ancestor of chess and other national chess-related games. Courier chess: Played in Europe from 13th to 19th century. Probably was one step in evolving modern chess out of shatranj. Shatranj: An ancient Persian game, derived from chaturanga. Short assize: Played in England and Paris in the second half of the 12th century. Tamerlane chess: A significantly expanded variation of shatranj. Apronus.com: Online chessboard with adjustable board width and height. Set up any chess position and make legal moves. Export and import PGN or FEN. Make diagrams of a single position or animated diagrams with a game fragment. Generate links to use as bookmarks, in blog posts or in email correspondence. ChessV: Open source software supporting around 50 chess variants, including such popular variants as Grand chess, shatranj, Three Checks chess and Ultima. Maker Chess: Mobile app allowing users to set up boards or create their own variant, then share these with other players to play and rate. SMIRF: Freeware supporting all FRC variants upon the 8x8 board and all CRC variants using the 10x8 board. WyeSoft Chess: Supports a few 8x8 variants, including Chess960, and allows users to play them against one another on the Internet. Zillions of Games: Commercial software supporting an unlimited number (but not types) of chess variants. One can write one's own rule files to create and play almost all chess variants, as well as almost any abstract strategy board game.